What are Nutrition supplements? Any product that provides some sort of nutrients (for e.g vitamins, minerals, amino acids, fibre, etc) can be termed as a ‘nutrition/dietary supplement'. They are sold in the form of tablets, powders, gels, syrups, etc. They can be used to supplement your normal diet, but cannot and should not be used as a substitute for a regular diet. Who needs/should take supplements? Those who eat a balanced diet and are healthy need not worry about supplements in normal circumstances. • Deficiency diseases- like anaemia(iron deficiency), osteoporosis(calcium deficiency), night blindness(Vitamin A),etc. • Those who live in areas where there is a deficiency of some nutrients for e.g those who live in hilly areas can have iodine deficiency, or those who do not get adequate sunlight (at least 10mins/day) can suffer from Vitamin D deficiency. 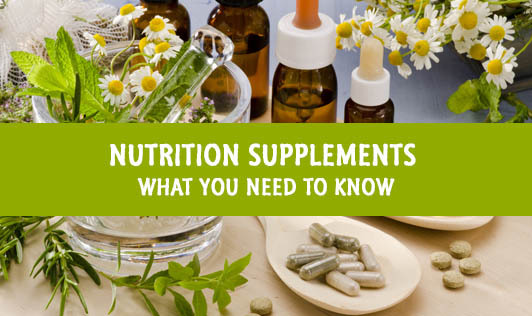 How does one know if nutritional supplements are required and in what quantities? If you have a doubt, speak to your doctor and/or Dietitian. They are the best people to determine whether you require supplements and the appropriate dosages if required. Keep in mind that the body absorbs nutrients better in its natural form (from fruits, vegetables), so don't be tempted to buy nutritional supplements unnecessarily!